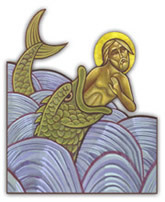 Read more: Jonah - "The Lord, his God"
On the 11th day of Tout, St. Basilides (Wasilides) who was a minister and counsellor for the Roman Empire, was martyred. He had many slaves and servants. Emperor Numerianus was the ruler, who was married to Basilides' sister, Patricia, and had a son called Yustus. Patricia was also the mother of Theodore El-Mishreke. Basilides had two sons: Awsabyos (Eusebyus) and Macarius. When the Persians waged war against Rome, Emperor Numerianus sent to them his son Yustus and Awsabyos, Basilides' son. Then he went to fight another enemy and was killed in that war. His kingdom was thus left vacant without a ruler. The people chose from among the soldiers a man called Agrippita, who was a shepherd, and they set him over the royal horses, stable. He was a mighty man in action, bold in his dealings. One of the emperor's daughters looked at him and took him as her husband. She made him emperor and called him, "Diocletian." Shortly after, he forsook the Lord God of Heaven and worshipped idols. When Wasilides heard this, he was sorrowful, and he did not return to the service of the new Emperor. The New Martyrs of Libya added to the Coptic Synaxarium. His Holiness Pope Tawadros II announced the inclusion of the 21 Coptic New Martyrs of Libya in the Synaxarium of the Coptic Orthodox Church today. Every year, they will be commemorated on 8 Amshir in the Coptic calendar, which corresponds to 15 February in the Gregorian calendar, the same day as the Feast of the Presentation of our Lord in the Temple. This beautiful icon, which is also featured on the front page, was drawn by Tony Rezk. May the Lord reward his talents.